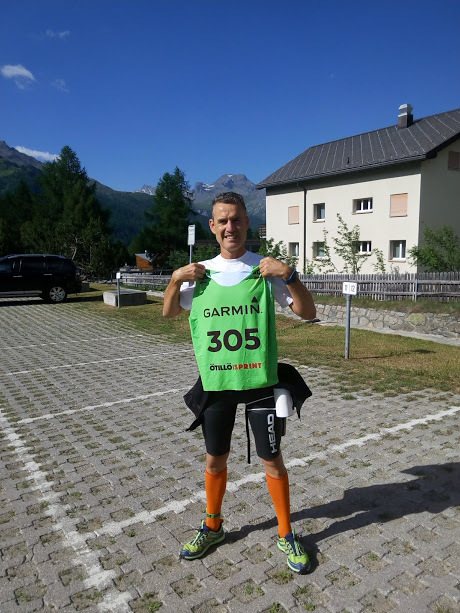 As newcomers to SwimRun, the first race we entered was the SwimRun Engadin event, months in advance, (organised by Ötillö) in the Engadin valley of Switzerland, not far from St. Moritz. This was before we knew anything about SwimRun. To be honest, we had no idea what we were getting ourselves into! As marathon runners, open water swimmers and seasoned sprint-distance triathletes, we thought this new sport looked very appealing. And the distances were not excessive compared to a marathon. But then we realised that sections of the running course were quite hilly, and that the water temperature in the high swiss lake would be around 10 degrees celcius! Add to that a possible air temperature of over 25 degrees Celcius - running in a wetsuit. The heat management issues are obvious. 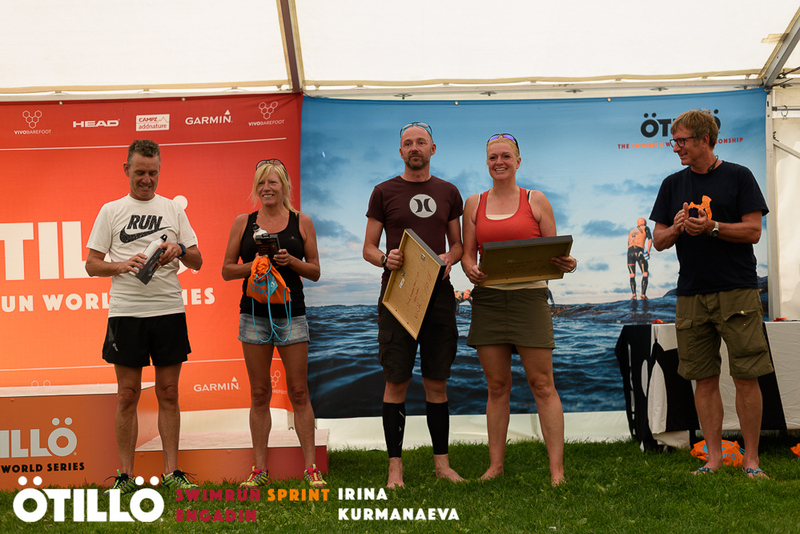 We decided to find a shorter sprint event to try out beforehand, and fortunately found the Ötillö Hvar event in Croatia. You can read about this HERE. But back to the SwimRun Engadin. Our training was not ideal, for several reasons. Mostly, it's just the heat here where we live in south-east Spain. Trying to train for any distance event during May, June and July is difficult! But we're not complaining! However, what we DID do is send in a request to Lollo at Ötillö requesting a switch from the main event (about 50km) to the sprint event (about 16km). Competing in the Sprint distance event gave us a much better chance of completing the course inside the cut-off time. BUT first let's look at the Swimrun Engadin set-up. 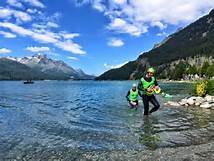 Set in the Engadin valley near St. Moritz, the Ötillö Swimrun Engadin is a unique challenge. There are 3 race distances, but this location is heavy on trail-running, with lots of climbing - (we call it vertical gain), and relatively short swim legs - compared to other swimrun events. 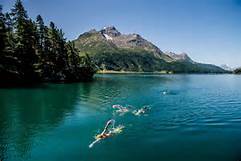 The main event at Swimrun Engadin is the World Series event, at 46 km. There is 40km of trail running (a Marathon is only 2 km longer), with almost 6 km of swimming. The Swiss lakes are quite cold, at around 10 degrees Celcius. The middle distance is the Sprint event, at 15 km in total. This is made up of about 12 km of trail running and 2.6 km of swimming, divided over 5 runs and 4 swims. There is now the option to compete at this distance as a single individual instead of in a team of 2. The shortest event is the "Experience" distance. This is intended to be a "taster" for the new sport of Swimrun, which you can enter either as a team of 2 OR as a single individual. The total distance is 6.3 km, divided into 4 runs and 3 swim sections. This distance also has less vertical gain than the longer distances. Ideal for a try-out! Our equipment changed quite a bit from the Hvar race, too. 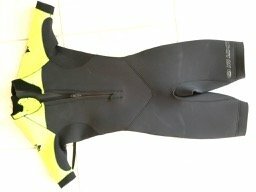 First off, Mogsy"s custom-made wetsuit finally arrived, after some modifications. She decided on short arms and legs, front AND rear zips, and (interestingly) EXTERNAL rear pockets. The double zips make it MUCH easier to get the top of the suit off when starting a long run leg (for cooling off! ), and then to get back on when approaching the next swim leg. 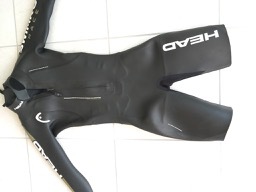 In training, the external pockets have proven to be far more accessible than the internal pockets with velcro closures on Richard's Head SwimRun RACE suit. The front view of Mogsy's suit. You can see the sneaky but very efficient rear pockets on the outside on Mogsy's suit in the image above. Her suit was created by Greg at No Limit Wetsuits in Wales. Richard has been busy too, finally cutting the long legs off his RACE suit, to just above the knees. It seems to be much better for running. At the moment, he's keeping the arms lightly trimmed at 3/4 length, bearing in mind those chilly Engadin lake waters! In the image above you can see just how thick the neoprene over the thighs is! 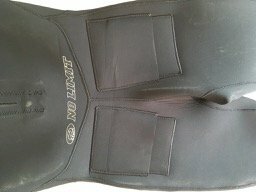 This creates more buoyancy, helping to keep the legs up in the water with less kicking. Well, we were allowed to switch to the Sprint event, and we completed the course inside the cut-off time! We were lucky to have a sunny day. Our preparations outlined above seemed to work well for us. Again, we did well on the swim sections, passing 2 - 4 teams on each swim, but losing the places back on the runs. You definitely have to be a good hill runner for SwimRun! We finished up 13th out of 23 mixed teams and 36th out of 50 overall teams that started (including men's teams and we were the oldest there! ), so allowing for our age (combined age 110+ years) and minimal training, we were happy with that! Richard approaching the end of the second swim, his blue gloves the only clue to who is in this picture! We won the raffle for Gococo socks and drinks bottles! Ötillö race director Mats Skott is on the right of the picture above. 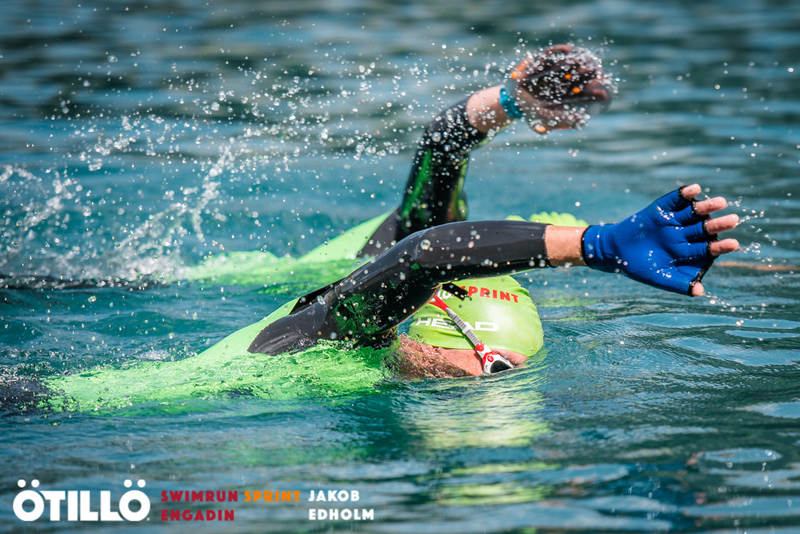 We hope you enjoyed our guide to Swimrun Engadin!